Since 1950, UZI has made their presence in the industry crafting iconic firearms and impressive equipment for the military, law enforcement and Special Forces. UZI has assembled an essential first responder kit for everyday use and this is it! 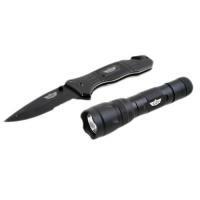 The kit includes an UZI-FR1 knife and LED flashlight, ideal for emergency situations, outdoor hobbyists or simply must-have tools for the car. An ambidextrous stud accommodates quick, one-handed opening of the knife's 3.5" semi-serrated stainless steel blade. The added seat belt cutter and glass breaker will serve users well during extreme situations. The handle features a textured, sure-grip for a secure hold when in use. A liner lock ensures your blade is stowed safely and the added belt clip allows for convenient carry. The 3W CREE LED flashlight has a maximum light output of 110 lumens powered by two CR123A batteries. Its body is crafted of durable, water resistant aluminum and includes a sure-grip handle. A rubberized seal encases the on/off switch. Like its partner, UZI's flashlight includes a belt clip. UZI's first responder combo kit should be at your fingertips and your first choice in case of emergencies. Flashlight Dimensions: 10.5" x 5.5" x 1.5"